The Boeing 787 Dreamliner is experiencing a scary, ongoing problem that nobody can seem to solve — the cockpit windows are cracking at an alarming rate. Air India is the latest to confront this issue, as recently as May 9th. A flight departing Frankfurt for Delhi had to return to the airport when a crack appeared shortly after take-off. The airline says they've experienced five instances of cracked 787 windscreens, including two on the same plane, registered VT-ANK, which is the plane most recently affected. 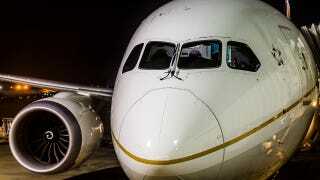 Last month, an Ethiopian Airlines Dreamliner developed a cracked windscreen at cruising altitude during a flight from Rome to Washington Dulles. The plane turned back to Rome and landed safely. Japan's ANA Airlines has also been hit with the windscreen issue, experiencing two of these incidents in 2012, and one in January of 2013. The most common problem that airlines have with flight deck windows is in-flight cracking of the outer ply. Conditions that lead to cracking begin with moisture around the aerodynamic seal (also referred to as the aero seal, moisture seal, or hump seal). Moisture ingress eventually causes delamination, heat-coating problems, and arcing, which — if not corrected — lead to cracking of the outer ply. The aerodynamic seal around the perimeter of a window is subject to erosion by wind and rain. Maintaining the aerodynamic seal in good condition is critical in preventing erosion and moisture ingress and improving the windshield service life. If it's a case of a failed aerodynamic seal, should these be failing on planes that are so new? The Air India plane, VT-ANK was built in October, 2012. Airplane window design flaws have been known to be catastrophic, most notably on the De Havilland DH 106 Comet. The corners on the square windows on the Comet's original design suffered metal fatigue due to the expansion and contraction of each flight. Three Comets broke up in mid-flight and crashed before the problem was identified and resolved with newly-designed oval windows that would distribute the stress more evenly. Whatever the problem is, Boeing and PPG need to get it sorted out. Every time a 787 has a maintenance issue, it makes headlines because of the battery fires it experienced early on in its service career. That problem has been resolved, but fuel leaks have also been a problem, along with hydraulic pumps, cockpit sensors and brakes. Top photo: United Airlines 787 by LoadedAaron on Flickr / Creative Commons commercial use.